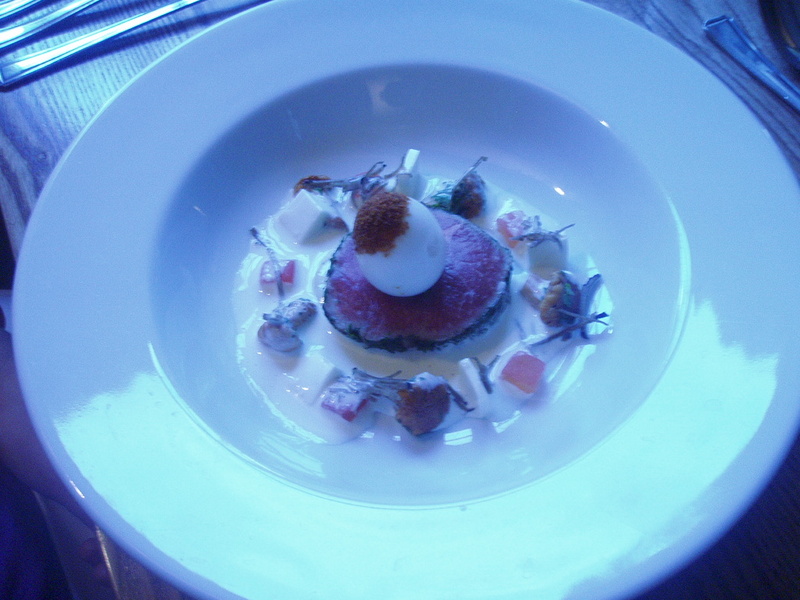 A couple of years back I had a great meal at Nick’s restaurant in Oakham, courtesy of chef Dameon Clarke. Yes it was bit a showy, a bit bling, but for all the complex plates and modish foams and jellies there was a focus on flavour that made the meal a resounding pleasure. Clarke is now established as chef patron at the Collyweston Slater, a handsome pub over on the Rutland/Lincolnshire border near Stamford. There’s a bar menu on offer but one look at the a la carte shows he is still interested in pushing the boat out – one starter involves rabbit and foie gras terrine with carrot jelly, pistachios, carrot and parsley salad and deep fried mustard ice cream. A little note on the website mentioning that he’s willing to create a seasonal tasting menu for those interested had raised our interest, so four of us headed out from Leicester on a Friday night prepared to be impressed. And we were. Mightily. First of all the pub. There’s low ceilings, a quaint exterior, and sympathetically modern interior. There’s plenty of room for local drinkers and an informal dining area staffed by refreshingly enthusiastic and knowledgeable staff. Now for the food. First off, a lobster latte – an intense fishy broth in tall glass topped with beautifully judged parmesan foam, and accompanied by spoonful of lobster meat with veg and a cube of mild ginger jelly. Great combinations of flavour and witty presentation. 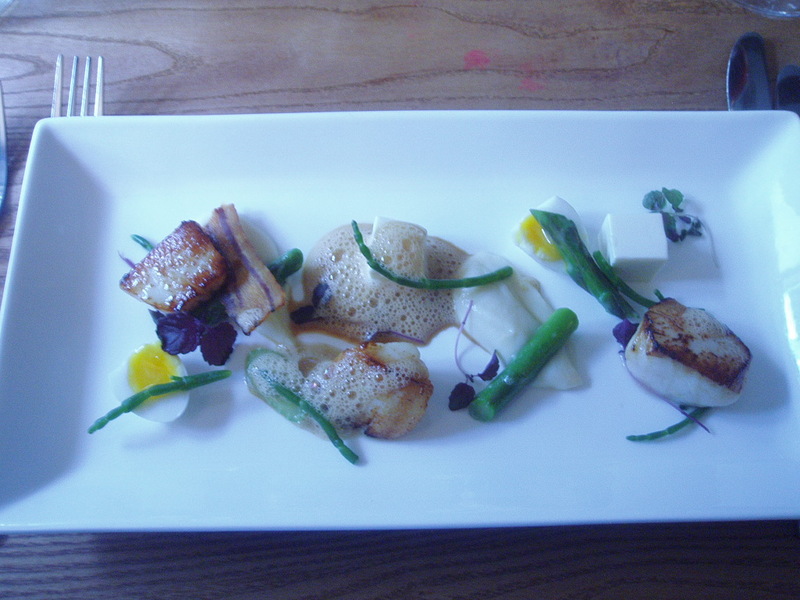 Next up were some seared scallops, topped off with a crab foam and prettily laid out with cauliflower puree, samphire grass, asparagus, quail’s egg, crispy pancetta and cubes of cauliflower panna cotta. Another wonderful collection of flavours put together with technical skill, even if the texture of the final item was not welcomed by everyone. Clarke had been happy to talk to us in advance about likes and dislikes but we had left it mainly to him to surprise us and the surprises kept coming. What was particularly pleasant was that our waiting staff seemed almost to be having as much pleasure at bringing and introducing our various dishes as we were in scoffing them. An exquisite carpaccio of beef followed – a lovely piece of meat complemented with more quails egg, truffles, wild mushrooms and a horseradish cream. It may all sound a bit busy but none of it overwhelmed the terrific centrepiece. 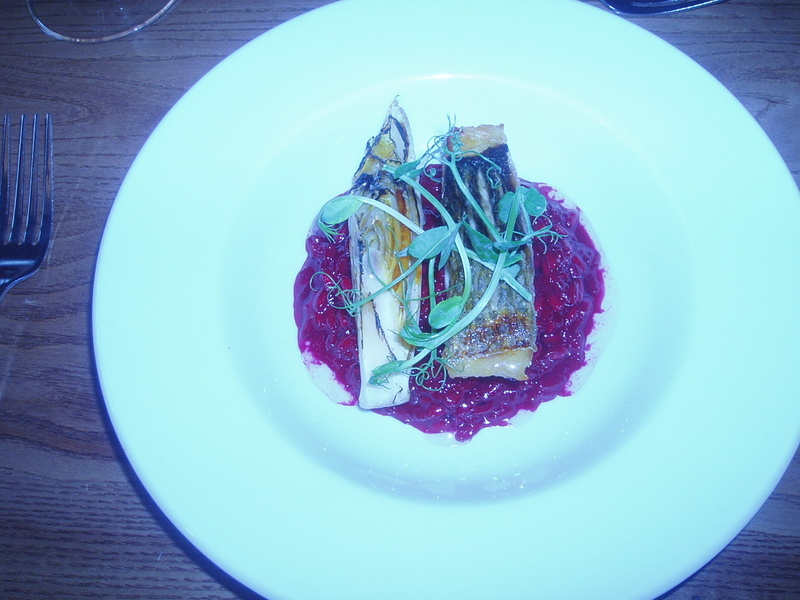 The next dish was probably voted our overall favourite – a cracking piece of sea bass with immaculately crispy skin, was perched on a beetroot risotto – probably the tastiest, definitely the prettiest food I’ve eaten all year. Grilled artichoke gave additional texture and flavour. Sadly the photo below fails to capture the vibrancy of the risotto, but let me asssure you it was simply lovely. The “main” course was some excellent belly and fillet of pork with generous shavings of truffle and a sweet squash puree. The potatoes – a kind of champ duchesse – were probably the only less than excellent element of the whole night, having a rather unpleasant texture. Coming towards an end now and we were treated to a very superior desert – a somewhat deconstructed rhubarb crumble cheesecake with rhubarb sorbet. The fruit came in a layered cocktail glass – a jelly, a compote and toped with a light crumble spiked with a touch of popping candy, some super- rich cream and a chocolate covered wafer filled, I think, with more cream and mascarpone. A gratifyingly stinky collection of cheeses finished off what had been a memorable meal. Friends compared it very favourably to a tasting menu taken late last year at Michelin-starred Glyn Purnell’s in Birmingham. At £45 this was better food, much better value, none of the corporate feel, and staff who not only put you at ease but were enjoying themselves. This kind of complexity is not going to convince everyone. But while there’s always a pleasure in, say, a simple salad picked fresh from the garden, sometimes it’s nice to sit back and say to a chef “come on, impress me”. If that’s what you’re after, get to the Collyweston Slater quick. The Joiners Arms in Bruntingthorpe has long been one of the lower profile but higher quality gastro pubs in the county. I’ve only been once but it is clear that gaffer Stephen Fitzpatrick is a quality act, you don’t get to keep a Michelin guide entry without knowing one end of a bain marie from another. So it was good news last year when he decided he also wanted the buzz of running a city restaurant and took on the Millstone Lane property in Leicester that had previously been home to the lively Italian Alloro and before that the much-missed Stones. I’m rather ashamed it’s taken me so long to get along to what seemed an interesting venture, but now I’ve been I’m fairly sure I’ll be going again. The familar L-shaped room is retained and there’s a smartish but informal air matched to a slight industrial aesthetic stemming from the remnants of the building’s days as a shoe factory (hence The Boot Room). 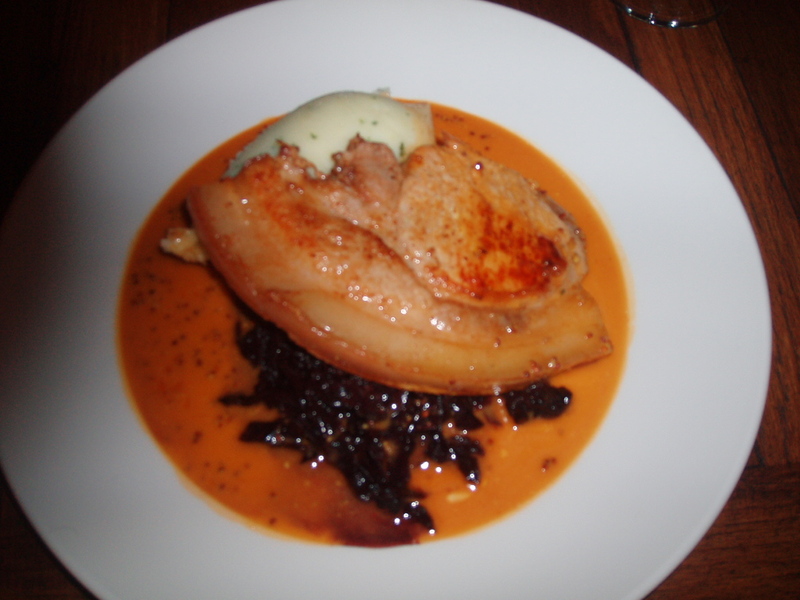 Menu is pitched somewhere between Bistro Pierre and the Case – pretty much mainstream contemporary European fare. Starters such scallops and black pudding or chicken liver parfait with brioche and chutney, mains such as roasted halibut , brown shrimp butter and skinny chips or shank of lamb with chorizo cassoulet. This being a Tuesday we both picked the Menu Auberge, a no-choice three course set menu including a glass of house wine at a good price of £15.95. We started with a well-made, full flavoured lobster and prawn bisque, let down only by some rather greasy croutons. Main course was a very tender and beautifully cooked pork loin chop, some hearty, spicy red cabbage, fragrant garlic-infused mash and a well-made mustardy sauce. (A sadly out of focus rendering can be seen to the right). Not complex food, then, but very satisfying all-round. The house wines were fine too. 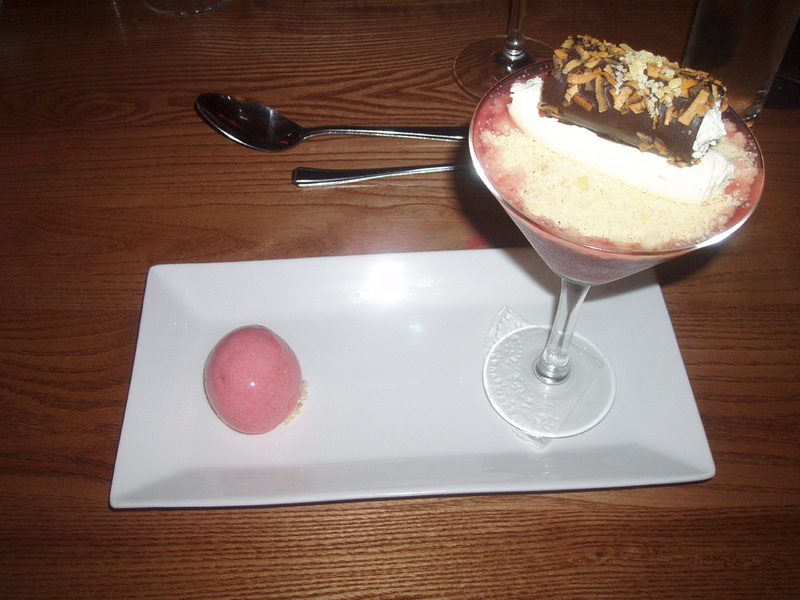 Desert was a raspberry dacqouise – not the most refined version of this classic desert but enjoyable anyway, it featured layers of hazelnut meringue, which here had a texture nearer pastry, with cream and fruit between. The Boot Room felt a pleasant well-run environment – we went on the first night for the new manager, who previously ran the rather brasher Las Iguanas – and I think it has a niche at the upper- middle end of local restaurants. I’ll refrain from full judgment until I’ve explored the a la carte but it looks promising. Further to the post earlier this week, sources close to this blog have revealed there is no change to the Michelin star status of Sat Bains, Hambleton Hall or The Olive Branch. There are no new stars in the region. Fans of the rarefied end of fine dining may be interested to know that Alain Ducasse has gained a star to become the nation’s fourth three star restuarant. Update at 17.33 – no new Bib Gourmands for the East Midlands either, though the Red Lion at Strathern keeps its one. The smart restaurant world industry is getting into its annual flurry of excitement over the imminent arrival of this year’s Michelin Guide. 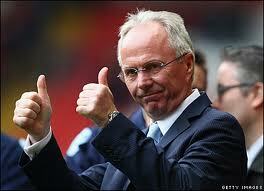 Details are closely guarded this year after previous leaks and will be released, apparantly, next Tuesday at 8am. Not that we’re likely to have anything to get worked up about in Leicestershire. In recent years the Red Lion at Stathern has won a Bib Gourmand, the guide’s designation for good food at moderate prices (up to £28 for a meal before drinks), and I believe Tom Cockerill had a listing when Entropy had its city centre restaurant, but beyond that I can’t think of much. Rutland has two one-starred establishments. Hambleton Hall is unikely to change status I suspect – more than good enough to keep its star, not fashionable enough to gain a second. The Olive Branch in Clipsham – as an informal pub environment – probably has to work harder than most to retain its star. Fingers crossed for them because it’s a lovely place. There’s a considerable industry buzz that Sat Bains in Nottingham will gain a second star (of which there are currently only 15 in the UK), but then there was last year and he didn’t. For those of us who enjoy restaurants this is all a bit of fun, even for the majority for whom michelin-starred dining is at best a very rare treat. And you can argue it’s all irrelevent anyway. But just imagine if Leicester did have a successful destination-dining venue. Just as gaining a John Lewis made a difference to the economic profile of the city, and stellar cultural projects have raised the game in that field, so a really top restaurant would help redefine our status as a backwater with a few good curry houses. Can’t say I can see it happening soon, for many obvious reasons, but one can dream.